We watched Rick Stein make this dish on a TV cooking show recently. 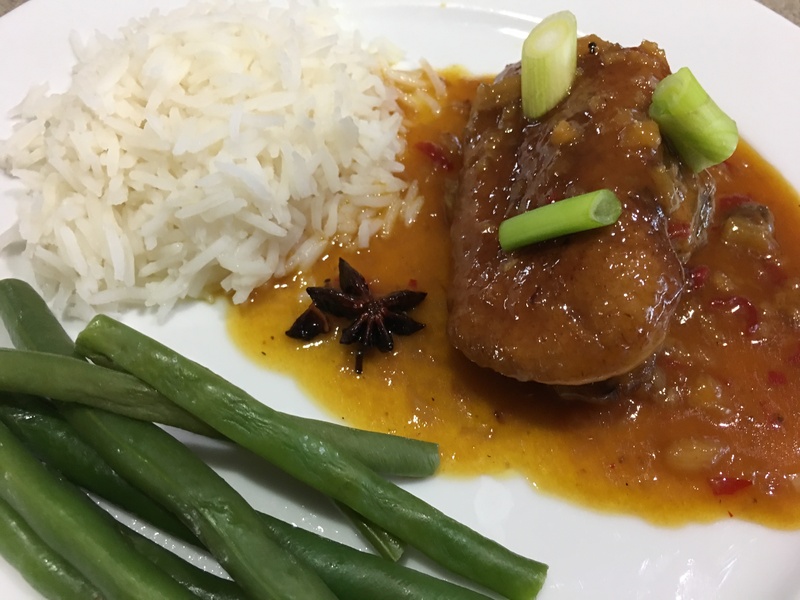 He described it as a Vietnamese take on Duck à L’Orange and said it was easy to make and delicious. Matthew is not a big fan of duck, but I am, so he felt magnanimous in suggesting we make it. The recipe calls for a 2.5kg duck but I bought a frozen one from Aldi for $14.99 which was 2.2kg. I also bought a bottle of orange juice with pulp from the same place. The recipe says to cut the duck into six portions, but you can only get 4 decent portions from a whole duck – two breasts and two Marylands (leg and thigh). I used the wings as well, so I did have six portions, but there’s not much meat on them. A better solution, especially if you’re entertaining and want six decent portions, is to buy six duck portions. If you use a whole duck, remove the portions, then use the carcass to make stock for another meal. I was left with more than a cup of duck fat which I poured through a sieve into a jam jar and put in the fridge. There’s nothing quite like potatoes roasted in duck fat – see last week’s recipe. Remove the breasts, legs and wings from the duck so you have four decent portions plus the wings. Heat a large heavy-based frying pan over medium to high heat. Cook the duck skin side down for 5 to 6 minutes until skin is crisp, then on the other side for 2-3 minutes, or until all the fat has rendered off. Once cooked, place in a deep saucepan and set aside. Pour all but 2 tbsp of the duck fat off and keep it (see Note below). Add the garlic and ginger to the frying pan and cook gently till soft, then add to the pan with the duck. Add the orange juice, fish sauce, star anise, chillies, lemongrass and season with black pepper. Simmer gently for 1 hour and 30 mins. Remove duck and set aside, skim off any excess fat from the sauce then bring to a boil and simmer vigorously until reduced and concentrated in flavour. Mix cornflour with 1 tsp of water, mix into sauce and simmer for a further minute. Recipe can be made ahead to this point. Put duck portions back into the sauce for a minute or to and heat through. Serve duck with rice and a green vegetable, garnished with the spring onions. Note: After removing the duck portions from the carcass I had quite a few pieces of duck fat or fatty skin. I put them into a frying pan and cooked them gently until most of the fat had been rendered. I added this to the fat obtained when browning the duck portions and poured it through a sieve into a jam jar. I tore this recipe out of one of the weekend newspaper magazines last month. It’s from Billy Law, a Malaysian cook who was on MasterChef back in 2011. I adjusted the recipe to use fewer dried chillies (2 instead of 5) and made a few other slight tweaks – spring onions instead of leeks because that’s what I had. The result is a delicious, spicy chicken dish which should serve 4, but Matthew and I both went back for seconds and there was less than half left! The method is a bit more fiddly than the recipes I usually post, but it’s worth it. Definitely a keeper. Mix chicken with ginger, soy sauce, mirin and pepper and leave to marinate for an hour. Mix in the potato starch and the egg. Heat about 2.5 cm of oil in a wok and fry the chicken pieces, in 2-3 batches, until golden brown and crispy all over. Remove and drain on paper towels. Wipe out the wok. For the Chilli Oil, heat the oil in a frying pan and add the garlic, ginger and leek or spring onion. Stir fry until golden then remove with a slotted spoon to a small bowl. Add the dried chilli flakes to the oil and stir for a minute, then pour through a sieve, discarding the chilli flakes and keeping the oil. Heat the reserved chilli oil in the wok and add the chopped onion. Stir until softening, then add the chillies and the sauce – soy sauce, sugar, vinegar and cornflour mixture – and stir till thickened. Add the fried chicken and the peanuts, stirring to coat for 1-2 minutes. Garnish with the reserved garlic, ginger and leek mixture and fresh coriander and serve with steamed rice. 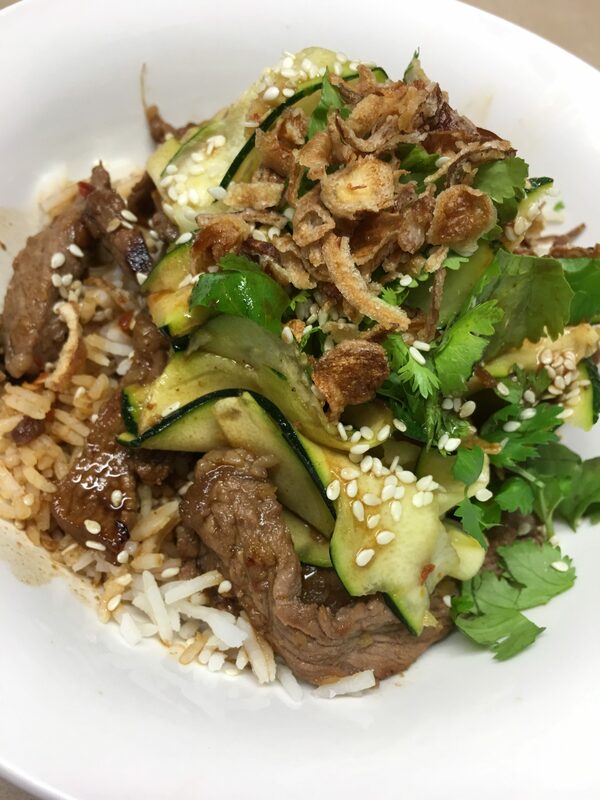 This is a good way to use up leftover cooked rice and leftover roast beef. If you don’t have either, cook some rice and slice about 300 grams of raw beef steak into thin strips. Stir fry the beef in the oil for a couple of minutes, then remove from pan, add the vegetables to the pan and proceed according to the recipe. Beat eggs withIn water and seasoning then make a thin omelette in a small omelette pan, using half the oil. Remove from pan onto a plate and cool, then cut into thin strips. In a wok or large frying pan heat remaining oil and cook the onion, garlic, carrot and capsicum, stirring constantly, for 2-3 minutes or until softened. Add the beef, chilli paste, rice, soy sauce and sesame oil. Stir fry for a couple of minutes. Taste and adjust seasoning by adding salt and pepper or a bit more soy sauce. If it’s not spicy enough, add a little more chilli paste. 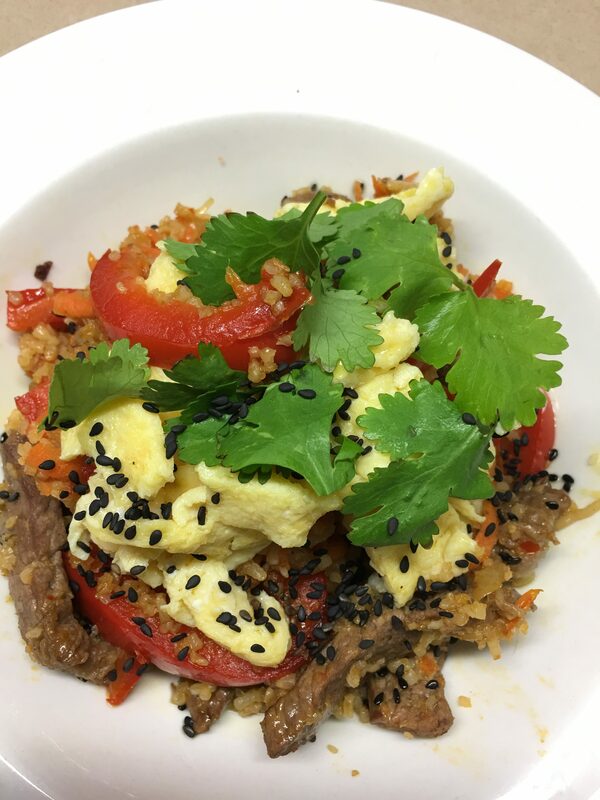 Serve in bowls, topped with the omelette, the coriander and the black sesame seeds. With zucchini growing in the garden at the moment I am on the lookout for new ways to use them. 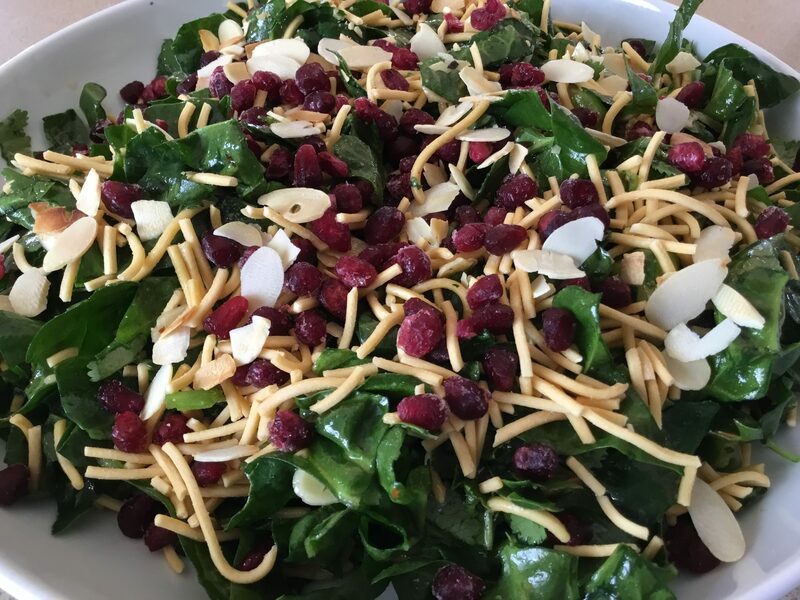 This recipe appeared in a recent Weekend Australian magazine as a salad. I have adapted it by adding the rice and heating the marinade (rather than discarding it) and pouring it over the finished dish. This recipe is quick but delicious. Place sugar and water in a saucepan and bring to the boil, stirring to dissolve. Add soy sauce, ginger, lime juice, chilli and sesame oil. Using a vegetable peeler, slice the zucchini into long, thin ribbons. Cut steak into thin slices downwards, across the grain. Marinate the zucchini in half the dressing and the meat in the other half for about 5 minutes. Drain meat (keep marinade) and stir fry in a large non-stick frying pan over high heat for 2-3 minutes. Drain the zucchini and keep the marinade. Place some steamed rice in two serving bowls. Top with the meat, then the zucchini ribbons. Place both lots of reserved marinade in the frying pan, bring to the boil, then pour over the top. Garnish with coriander, sesame seeds and dried shallots. My friend Doug and his wife had a holiday in Sri Lanka last month. The gourmet food tour was organised by a company called Intrepid Travel and they had a fantastic time tasting delicious local food at restaurants, cafes and private homes, as well as visiting food markets and factories. 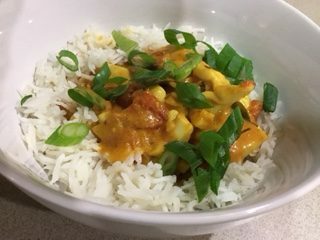 This Squid Curry was one of Doug’s favourite dishes so he sent me the recipe and I decided to give it a try. I left out the pandanus leaf because the Asian supermarket I use only sells it in huge bunches, but I did buy the curry leaves. The ones I didn’t use will keep for next time. I added a touch of sweetness with the palm sugar and used spring onion as a garnish because I didn’t have any coriander. The squid itself doesn’t have much flavour but the overall result makes a nice change from the usual chicken, beef or pork curries. Cut squid into bite-sized chunks and score any thicker pieces. Mine were all the same thickness so I didn’t need to do this. Wash and dry with paper towels. Heat oil in a wok or large pan over high heat. 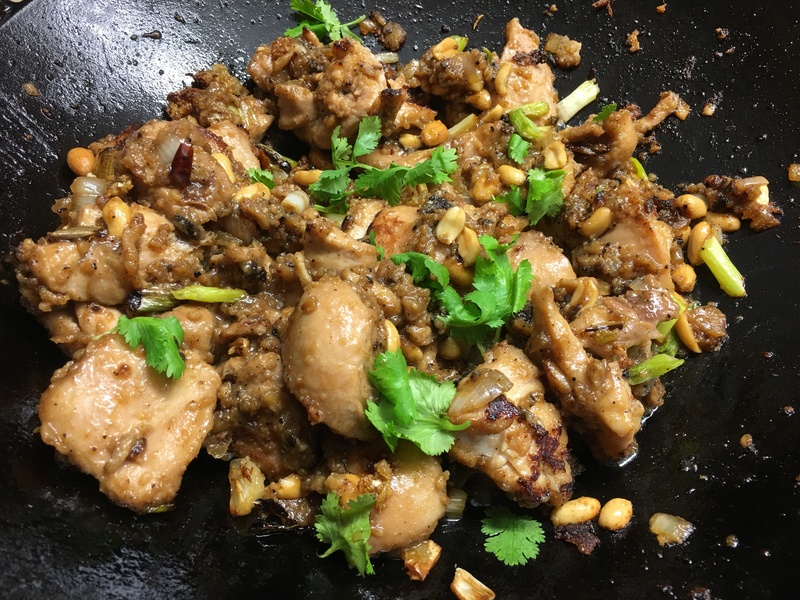 When very hot add the curry leaves, pandanus leaf and whole seeds and stir for a few seconds then add the ginger, garlic and onion. Stir fry until starting to brown then add the ground spices and tomatoes. Stir-fry for a few minutes. Add coconut milk and mix well. Simmer to reduce slightly, season with cayenne pepper and salt. Can be prepared ahead of time to this point. Mix in squid and cook for a few minutes until tender. This won’t take long and if you overcook it the squid will be rubbery. Garnish with coriander or spring onion and serve with steamed rice. According to No.1 son, this easy mid-week recipe is the way to get kids to eat broccoli. Well it worked with his two sons who are ten and eight. If you can’t be bothered with the Ponzu sauce just serve the meatballs as they are, or with some soy sauce drizzled over. Preheat oven to 180°C. Mix all ingredients for meatballs and form into 2-3cm balls. Mix broccoli with half the oil, salt and pepper. Line a tray with baking paper, arrange broccoli in one layer then roast for 20 mins. Heat remaining oil in a large non-stick frying pan and brown meatballs all over. Place them on another paper-lined tray and bake them for 5-10 minutes. Broccoli and meatballs should be ready at about the same time. Wipe out frying pan then add the miso paste and butter and heat to dissolve. 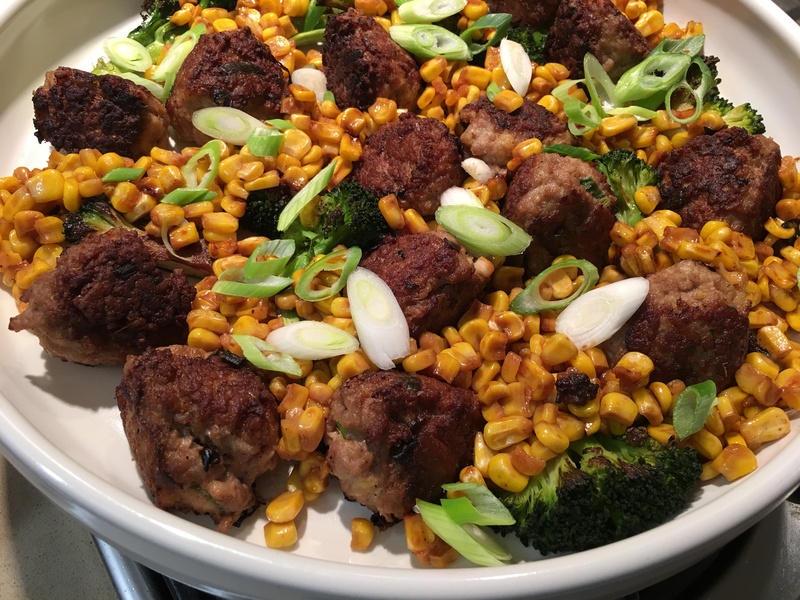 Add the corn, broccoli and meatballs and cook, stirring, for a minute or two, until coated with the sauce. If mixture seems a bit dry add a couple of tablespoons of water. Serve the meatballs with steamed rice, garnished with the spring onion. Pass the Ponzu sauce round separately. Note: Miso paste is a Japanese ingredient available in some supermarkets and Asian shops. If you can’t find Ponzu sauce make your own by mixing 2 Tbs soy sauce, 1 Tbs each lemon or lime juice and mirin (sweet rice wine), 1 tsp sugar and a pinch of cayenne pepper. The first Australian Women’s Weekly cookbooks were published in the late 1970s and constituted a turning point in Australian cuisine. There were very few cookbooks on the shelves back then and everyone had the same ones. My small collection included The Margaret Fulton Cookbook, The Complete Asian Cookbook by Charmaine Solomon, Great Dishes of the World by Robert Carrier and Mastering the Art of French Cooking, volumes 1 and 2, by Julia Child. From 1976 the Women’s Weekly released a new book every few months – eagerly awaited by keen cooks around Australia. My friend Ferne and I made every single recipe and compared notes when we met. Home cooks started asking their local supermarkets for new and unusual ingredients and the supermarkets had to keep up with the demand. 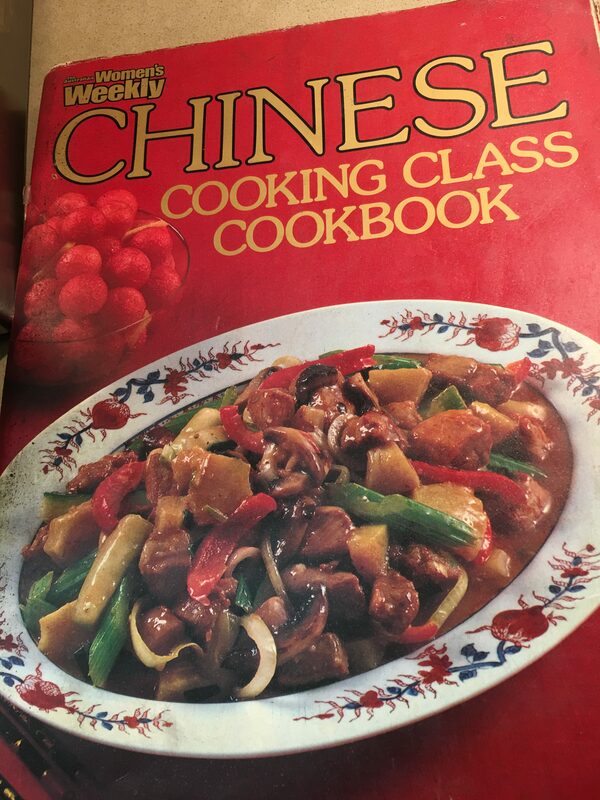 The Chinese Cooking Class Cookbook hit stores in 1978 and sold out within a couple of weeks. Since then, it’s been reprinted countless times, selling over 4 million copies around the world. My well-worn copy, now almost 40 years old, has comments and amendments on every recipe. The price of $3.98 is on the front page and believe me, I got my money’s worth. This is where I learnt to cook Chinese food, before I moved on to the likes of Ken Hom and Kylie Kwong. If you don’t have a copy and can find one online or in a bookshop, grab it. You won’t be disappointed. To say it’s an oldie but a goodie would be an understatement. Other favourites of mine were Beautiful Biscuits, the Italian Cookbook and the two Dinner Party Cookbooks, but there must have been around 50 in the full series. For about five years they were my bibles and although I rarely use them now, I can’t bear to throw them out. I haven’t made this fish recipe for over 10 years and had forgotten how good it was. The original recipe has twice as much batter, but I find this amount is just enough. I hope you enjoy it as much as we do. Cut fish into 2-3cm chunks. Mix all ingredients for batter until you have a thick, smooth batter. Place all ingredients for sauce in a medium frying pan, bring to the boil, then turn off the heat. Place all the fish pieces in the batter and turn to coat. Heat about 5cm oil in a wok, deep fat fryer or saucepan. Remove fish pieces one at a time from the batter and lower into the hot oil. Cook them in 2 or 3 batches until golden brown and cooked through. Drain fish and place in the frying pan with the chilli sauce. Turn on the heat in the frying pan and cook for a couple of minutes, turning the fish pieces gently, to coat them with the sauce. Garnish with spring onion slivers and serve with steamed rice. 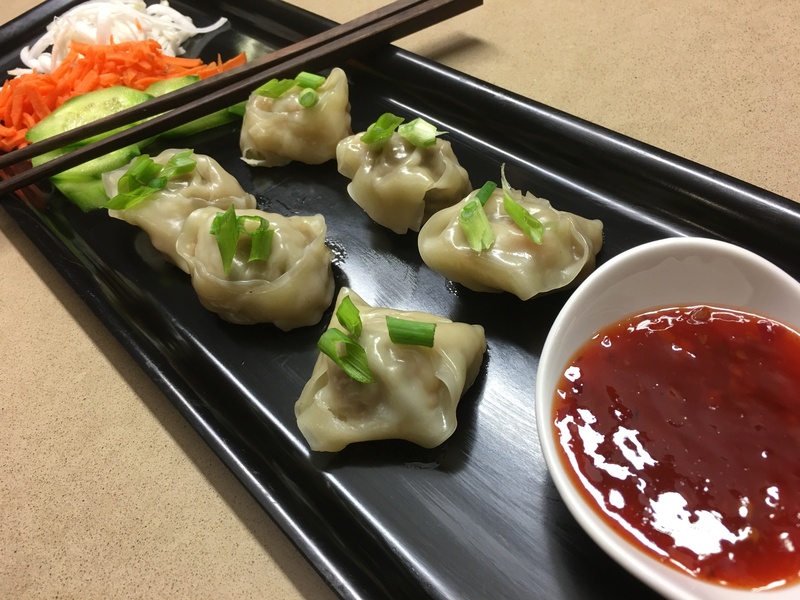 I was inspired to make these tasty little morsels after watching a cooking show on TV where one of the contestants made fried wontons. I came up with this recipe by combining ingredients from two I found online. It made 26 so I served half one night, fried and half two nights later, steamed. The fried ones were nicer but the steamed ones were probably healthier. I’ve included a photo of both. Wonton wrappers are available in many supermarkets and all Asian grocery stores. Mix the mince, prawn meat, garlic, ginger, hoisin or oyster sauce, five spice and spring onions and season. Place a heaped teaspoon of filling on each wonton wrapper. Using your finger put a little egg white along two adjacent edges, then seal the wonton into a triangle. Bring two edges together and overlap then press to seal, as shown in photo. 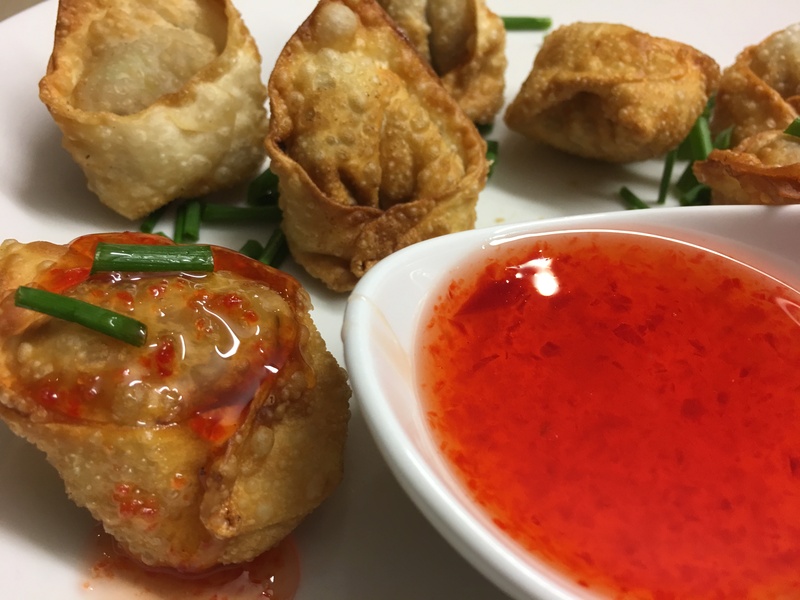 You can fry the wontons in a deep fat fryer or in a wok where you will need the oil to be a minimum of 5cm deep. Or they can be steamed. If frying cook, a few at a time, for 1-2 mins or until cooked through and golden. Drain on paper towel. If steaming they will take 5-6 minutes. Serve with sweet chilli sauce for dipping and garnish with the snipped chives and a vegetable salad. I haven’t posted any mouth-watering desserts of late. I’m trying to avoid them at the moment in an attempt to make some headway in the battle of the bulge. I always seem to be on the losing side in this battle, which I guess is par for the course when you love cooking and eating as I do. Anyway I like to think that this blog provides inspiration for subscribers wondering what to make for dinner tonight. Quick and easy, everyday dishes are the mainstay of Café Cat. 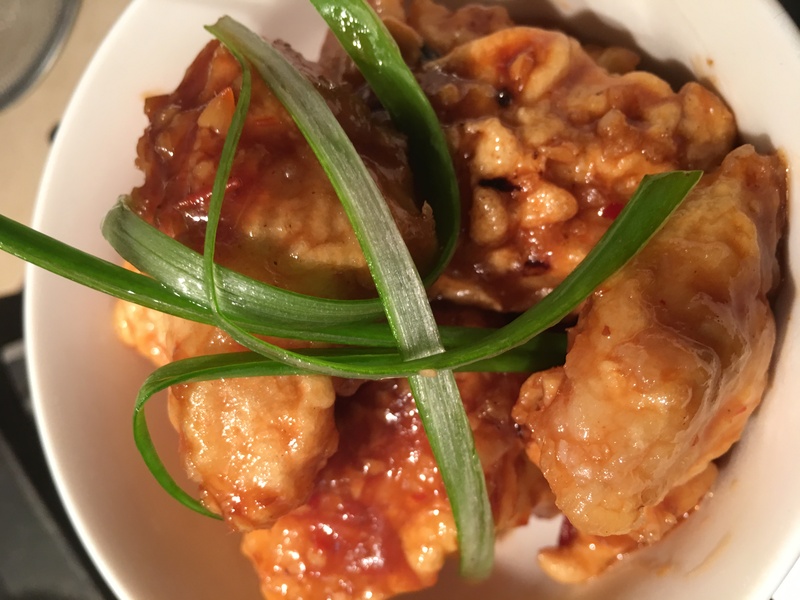 Fans of sweet sticky Asian meat dishes will like this one. Adjust the amount of brown sugar to suit your taste. The recipe doesn’t contain any chilli (though you could always add some) so it’s a good way to introduce young kids to Asian food. If you (or the kids) don’t like mushrooms leave them out and increase the meat. Heat oil in a large frying pan or wok and cook the onion until soft, then add the mushrooms and continue to cook, stirring, until mushrooms are starting to brown. Remove from pan. Add a tiny bit more oil to the pan with the beef strips and stir fry until browned. If you are using leftover roast beef this won’t take long. Add the brown sugar, soy sauce, garlic and sesame oil and cook, stirring, for a few minutes, or until sauce is thickening and glazed. Return mushrooms and onions to the pan. As soy sauce is salty you probably won’t need to add salt to this dish. If the mixture is a bit dry, add 2-3 Tbs water and stir to combine. 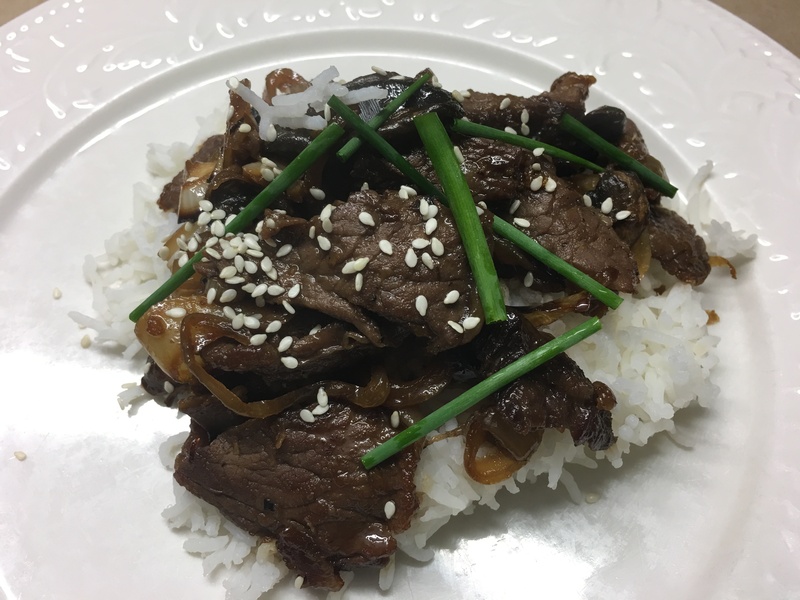 Serve beef with steamed rice, garnished with sliced spring onions or chives and a few sesame seeds.